How to get Mods? The fastest way is to make your character more powerful by modding their weapons and gear. Mods can make items way more powerful and improve your core attributes and skills. 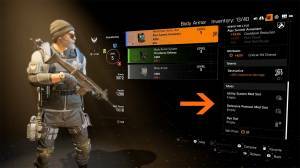 The Division 2 is different from the first game, weapon modifications are no longer drops and are instead rewards that are unlocked when you level up your character. Once you have unlocked a mod it will be yours forever and can be used on every eligible weapon you have and as many times as you want. Although every weapon mod has positive traits they also have negative ones so you will have to think carefully when selecting mods for your weapons. An example of this is adding an expanded clip, although it will give you more ammunition it will make your weapon take longer to reload. 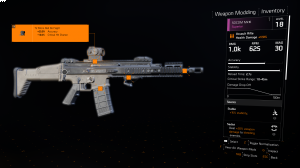 Gear mods in The Division 2 drop like they did in the first installment of the game and they still have random bonuses and stats which are based on the gear mod’s rarity. • Have both positive and negative effects. • Mods are no longer dropped as loot. • Must be unlocked through challenges of some sort. • Can be equipped on all eligible weapons at once. • They now have static rolls. Listed below are all the different mod slots that can be found on any given weapon type. Upgrade your weapon's magazine to hold more rounds and fire faster. Add things like grips for less recoil and laser pointers for better accuracy. Change your weapon's scope or sight. Certain scopes will allow you to go first-person. Add suppressors for stealth or other muzzles to change how bullets fire. Personalize your weapon with various skins and tints. 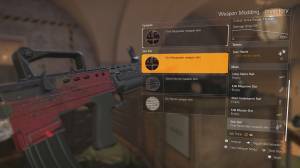 There are two ways in which you can get mods in The Division 2. You can either talk to the Quartermaster at Base of Operations about Perks or by completing side missions. If you talk to the Quartermaster about Perks you will learn that there are four separate perks that unlock weapon attachments in exchange for SHD tech: Muzzle, Magazine, Grip, and Optics. Once these have been unlocked you will have a suite of basic mods to customise your weapons. If you open up your map of Washington D.C. you will notice several side missions scattered around the map. They will be indicated by blue pentagons which may or may not have an SHD symbol attached. If you click on them you will be able to view whether the reward is a blueprint for a weapon mod. Remember that these are only blueprints for a weapon and that you will still need to know how to craft them once they are unlocked. The mods that do not initially unlock as perks in The Division 2 will need to be crafted. To be able to do this you will first have to recruit Inaya al-Khaliq in the Base of Operations. Completing the first Main Mission at the Theater will add Inaya to your roster. The benefit of adding her is that it unlocks the crafting table and the ability to craft items. Once you have unlocked Inaya al-Khaliq return to the Base of Operations and turn right in the hallway after the main entrance. There you will find Al-Khaliq set up and ready to begin work. Activate the table and click on the Mods/Misc section to see which mods are ready to be crafted. At this point of the game you should have enough materials to select at least one mod at the crafting table you can craft. If however you do not you will have no option but to set out into the world to find them. You will find it easier if you make the mod you want to craft your current crafting project and just focus on picking up the resources needed for it. 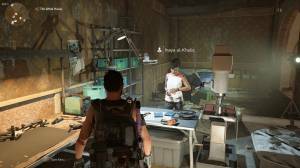 Once the requirement has been met return to Al-Khaliq at the Base of Operations and you will be able to craft it at the crafting table. Once you have either unlocked or crafted a mod you will want to equip it to your weapon. This can be easily done by openng up your inventory and either hovering or clicking on the mod button ('Square' on PlayStation 4, X on Xbox One, and F on PC) so you enter the mod screen. All you need to do now is fill up the designated number of slots (the little squares) on a weapon with the corresponding mod you have either unlocked or crafted. It is important though that you make a note of the statistics of the mod so you are aware of any compromises that may come with it.